Extra heavy bodied, slow setting, high strength, Low VOC solvent cement for all grades and types of PVC, UPVC (PVC-U) pipe and fittings through 30"(800m)(diameter Schedule 40 Sch. 80 interference fit. Specially formulated for large size industrial piping systems and fabrication joints. It has excellent gap filling properties. Meets ASTM-D 2564 standard requirements. 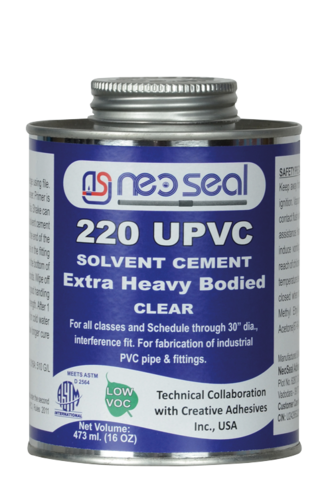 Since 2011, we,”Neoseal Adhesives Private Limited” is prominent manufacturer and supplier of broad spectrum of Solvent Cement, Adhesive Gum and many more. Widely known in the market for executing masterly amalgamation of raw material and technology, our products are much demanded in the market. Our offered products are known in the market for excellent durability, working efficiency and robustness traits. We make sure to serve the precise needs of customers by offering them products which fulfills the latest industrial norms. With the aim of serving vast array of products to customers effectively, we have implemented state-of-art infrastructure facility. This unit comprises of advanced production, quality inspection and vast warehouse facility. We make sure to fabricate our products with maximum precision with the efficient use of technology. In addition to this, we make the primal use of quality inspection unit for ensuring their life-long functionality. With these prospects we have earned ourselves respectable clientele base in this domain.